After proving herself a worthy collaborator in the wilds of Dromund Kaas, Empress Acina forged an alliance with you against the Eternal Throne. 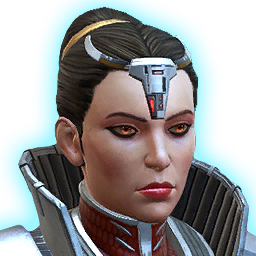 Despite her best efforts to forge an alliance against Vaylin, Empress Acina was unable to win your trust. The Sith will now be forced to stand alone against the Eternal Empire. When war erupted on Iokath, Acina joined you to fight the Republic for control of the planet's ancient technology. When war erupted on Iokath, Acina failed to forge a partnership with the Eternal Alliance. She now fights you and your Republic allies for control of Iokath's ancient technology. Empress Acina nearly succeeded in claiming Iokath's most powerful superweapon, but died while trying to control the dangerous technology. The Sith Empire mourns her loss.